Photo source: Copyright © Create Thailand, YWAM. Used with permission. 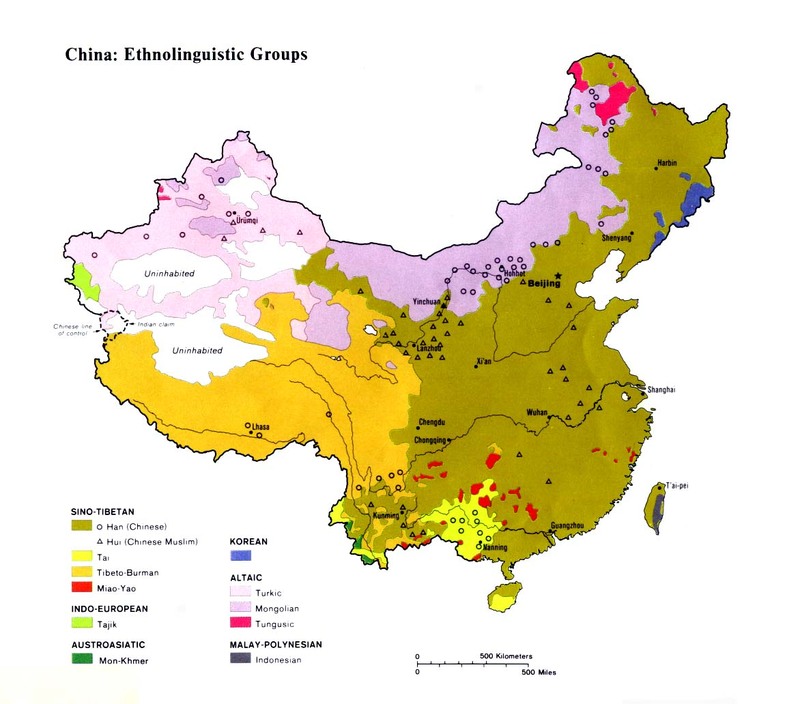 The Tu - who are one of China's official minorities - believe they are descended from white feathers that were left behind by a flock of cranes. The Tibetans consider the Tu to be a part of the Tibetan nationality and accuse the Chinese of trying to weaken the unity of the Tibetan world by granting the Tu a separate identity. However, there is no doubt that the Tu are distinct from the Tibetans historically, culturally, and linguistically. There are two distinct languages spoken among the Tu: Huzhu, which is profiled here, and Mongour, which is covered separately. Sixty percent of Tu vocabulary is still Mongolian in nature after 800 years of isolation. In 1979 a Tu script based on the Roman alphabet was created. It soon became popular among the Tu. The script is taught in local Tu schools today. A massive 70,000-entry Tu-Chinese dictionary was published in 1988. There are 11 different dialects within the Tu language. The Tu living in Datong County can now only speak Chinese. In addition, more than 4,000 ethnic Tu people speak Bonan as their mother tongue. The Tu were first recorded in AD 1227, when a Mongol garrison was dispatched to control the area that the Tu still inhabit today. The troops remained there and later married women from local tribes. A bronze statue of the first Mongol general still stands in the Youning Monastery. Another historian states, "Their ancestors are believed to be the Tuguhuns who moved in the third and fourth centuries to Gansu and Qinghai provinces and mingled with local people of different nationalities. Places where the Tu people live in compact communities are still called Tuhun in the Tu language." Until recently Tu girls were expected to be married by the age of 15. After that age, the girl was considered "married to heaven." If a Tu woman is still single by her mid-20s, she is allowed to sleep around, thus saving herself from disgrace in the eyes of the community. Any resulting children are raised by the entire Tu village. Unmarried Tu women wear a single ponytail to advertise their status to prospective partners. 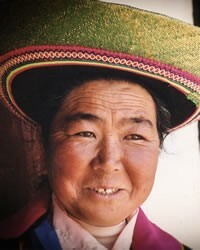 The Tu are ardent followers of Tibetan Buddhism. Their main religious center is the Youning Monastery, founded in 1604. Shamans and mediums are also active among the Tu. The annual Nadun Festival focuses around the fala, a Tu medium who "impales himself with as many as 12 iron nails and is possessed by the spirit of the Erlang god." Prior to the forced deportation of missionaries from China in the early 1950s, a handful of Tu Christians attended Han Chinese churches in the area. Although there are no known Christians among the Tu today, there are about 400 Han Chinese believers living in the mountains 25 kilometers from Huzhu. They interact with the Tu and even speak the Tu language. View Tu in all countries. 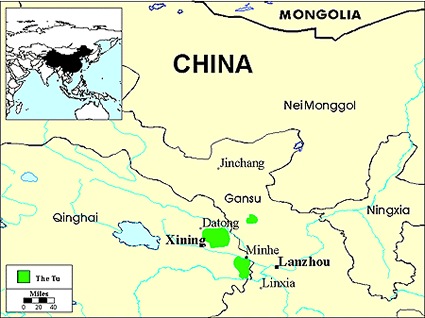 Location in Country: Most live in north-west China, especially in Huzhu Tu Autonomous County in Qinghai Province. Others are scattered throughout other parts of Qinghai, as well as in neighboring areas of Gansu Province.